FASAVA - The Beginning ! FASAVA arose from a realization by a core group of Asia pacific veterinarians that there was a need for an international small animal veterinary group to act as a forum for their specific regional needs. In 2002, a group of veterinarians from various Asian small animal veterinary associations came together at the 27th WSAVA Congress in Grenada, Spain, to discuss the formation this group. As the Chairman of WSAVA CE in Asia, I was asked to assist in the formation of FASAVA. Association representatives from Australia, China, Hong Kong, Iran, Japan, Korea, Malaysia, New Zealand, Thailand and Taiwan were represented in the discussions over the following 3 years. The Asian group of vets met each year at WSAVA Congresses in Thailand in 2003, Rhodes in 2004 and Mexico City in 2005. 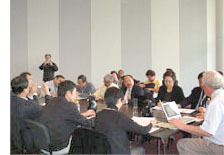 Finally at a WSAVA CE meeting in Taipei in 2005 a final decision to form FASAVA was made. A constitution and rules based on the FAVA model were drawn up with appropriate modifications and adopted by the founding members of the group and sent to all interested parties. It was unanimously decided at this historic meeting to hold the 1st FASAVA meeting in conjunction with the WSAVA 2007 Congress in Sydney Australia and to hold the second Congress in Bangkok, Thailand in 2009. I was elected as inaugural chairman and Assoc. Prof. Parntep Ratarnakorn from Thailand was elected as Chairman- Elect. Asian veterinary associations do not share a common language, but share a common geographical region in which small animal veterinary medicine is a relatively new and rapidly growing area of interest. FASAVA held our first Council meeting in Sydney in 2007 and I announced that FASAVA had been formed as a company under Australian company law and that all regional associations who wanted to join would be sent invitations. FASAVA was designed to be an association of associations in a similar manner to WSAVA and applications can be accepted from all associations in the region. Since this inaugural Council meeting invitations have been sent to the foundation associations and small animal associations from Australia, Taipei, Beijing, Shanghai, New Zealand, Thailand and Hong Kong have already joined. The 2011 meeting of FASAVA will be in conjunction with the WSAVA meeting in Jeju, South Korea. hosting other vets from Asia and the world. Eventually, FASAVA will take over the role of the WSAVA CE programme with regional CE programmes for the various member associations. FASAVA will act as a common Asia Pacific forum for companion animal practice - to bring us all together to solve regional differences and to provide solutions to regional problems. FASAVA grew out of the WSAVA and will work cooperatively with the WSAVA whenever the two come together. With time, FASAVA will become one of the leading attractions on the veterinary calendar for vets around the world. FASAVA in Bangkok, Thailand in 2009 will be an excellent launching pad and we welcome you all there in November. I welcome you all to join FASAVA in this great endeavour.